In the short film Jan Kiepura (2005), a woman looks into the camera, laughing shyly. She turns her head to the side, tidies her hair, blinks her eyes, but she keeps looking. ‘Why do you do that?’ she asks in French, and pushes away the equipment in a mock-threatening way. The rest of her words are spoken in an incomprehensible Polish. They seem to be spoken more to themselves than to the man behind the camera. Beyond that, nothing else happens. At the mercy of photographer and filmmaker Maarten Tromp, you see her every furtive movement. The woman’s apparently casual gestures are threaded into an anecdote, or better said, a chance meeting on a night train becomes a short story on film. The stubborn persistence and questioning manner demonstrated in Jan Kiepura are characteristic of Maarten Tromp. The woman could be anyone. Why has he chosen her in particular? As a viewer, you are surprised at the camera’s power to intrigue. In this contact, what the person filming and the person being filmed share is a love for the medium. Apparently for both of them, there is a story in this encounter. The woman keeps looking, talking. She seems to want to say something. The cameraman does not stop his camera, despite her motion to ward it off. He registers her behaviour and reads her story. He is reader and author in one. In the short film Jan Kiepura (2005), a woman looks into the camera, laughing shyly. She turns her head to the side, tidies her hair, blinks her eyes, but she keeps looking. ‘Why do you do that?’ she asks in French, and pushes away the equipment in a mock-threatening way. The rest of her words are spoken in an incomprehensible Polish. They seem to be spoken more to themselves than to the man behind the camera. Beyond that, nothing else happens. At the mercy of photographer and filmmaker Maarten Tromp, you see her every furtive movement. The woman’s apparently casual gestures are threaded into an anecdote, or better said, a chance meeting on a night train becomes a short story on film. The stubborn persistence and questioning manner demonstrated in Jan Kiepura are characteristic of Maarten Tromp. The woman could be anyone. Why has he chosen her in particular? As a viewer, you are surprised at the camera’s power to intrigue. In this contact, what the person filming and the person being filmed share is a love for the medium. Apparently for both of them, there is a story in this encounter. The woman keeps looking, talking. She seems to want to say something. The cameraman does not stop his camera, despite her motion to ward it off. He registers her behaviour and reads her story. He is reader and author in one. 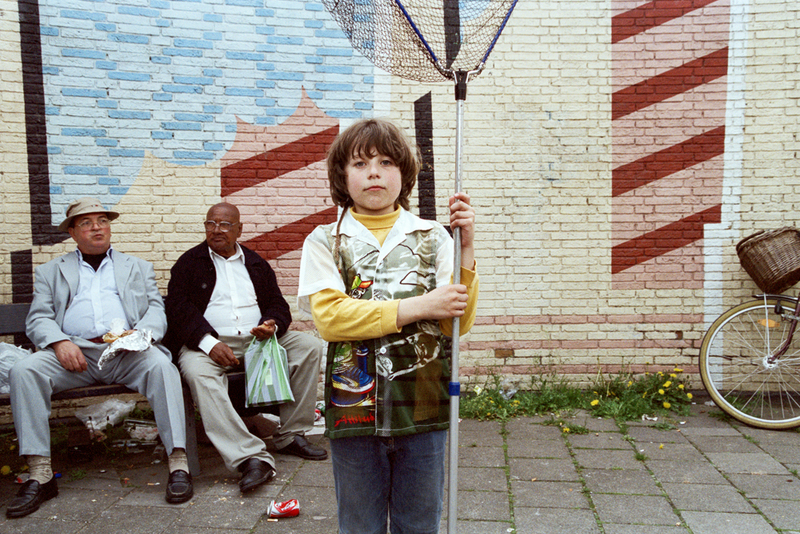 In a comparable manner, over the last two and a half years, Maarten Tromp has recorded East Amsterdam’s district ‘Indische Buurt’, this time with still cameras. Unforeseen coincidences, grand and compelling or as small as birds taking flight, capture his attention. They stir his involvement in the neighbourhood where he has been living for some time now. His images also slowly began questioning negative newspaper reports that label this neighbourhood as bad or wrong. In De buurman, z’n ex en de eigenaar van de wasserette. Beelden uit de Indische Buurt, Amsterdam (The Neighbour, His Ex and the Owner of the Laundrette. Images from the Indische Buurt, Amsterdam) Tromp restores, almost indignantly, the human face of ‘his’ neighbourhood. He heals, as it were, the intimacy disrupted by the negative press. As in Jan Kiepura, he does so by renewing personal contact with the neighbourhood residents. 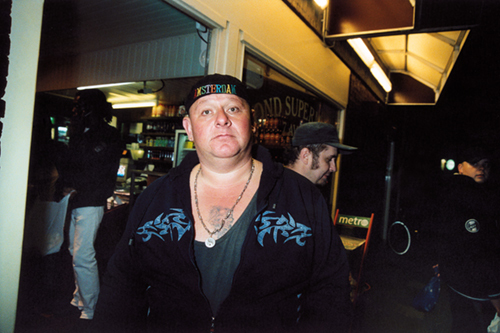 Maarten Tromp’s working methods are reminiscent of earlier filmmaker-photographers, such as Ed van der Elsken. In the film, A Photographer Films Amsterdam (1982), Van der Elsken himself gave an almost naïve, in any case sentimental commentary on what he saw, or engaged in verbal dialogue with what he was filming, but the work of Maarten Tromp also brings a project like Me and My Brother (1964), by Robert Frank, to mind. In it, Frank reflects in writing about the one-to-one relationship that is created via the camera and film, yet is in fact undermined at the same time. In printed letters, he scribbles on sheets of contact prints. ‘...wouldn’t it be fantastic ... if the eye were its own projector instead of its own camera? I am a camera.’ Wishful thinking. The words undermine the myth of the camera as a purveyor of truth. In the work of Van der Elsken and Frank, the camera strikes a lyrical tone and promptly becomes a poet. Although Maarten Tromp’s sometimes extremely subjective approach brings him close to Van der Elsken and Frank, Tromp also permits himself other freedoms. He puts individuals alongside one another, thus suggesting a link or relationship between the two, who are often unknown to each other. An older man becomes a prisoner by the hand of a policeman, who is in fact a civil guardsman, resting on his shoulder. There is a conspicuous likeness here to The Arrest (1989), by Jeff Wall. There too, a man is held fast, but by two policemen. The person being arrested looks fearful and the officers’ authoritarian ascendancy gives the picture a threatening atmosphere. We know the image has been staged, but that seems of little relevance, because it is with our own unconscious thinking in terms of types and preconceived categories that both Wall and Maarten Tromp confront us. The combination of elements in the image causes our expectations to waver; the combination of images in Tromp’s book does the same. Behaviours seem to speak for themselves, but according to the photographer, the language is sometimes hardly understood. Tromp expresses the secret doubts of the reader, the unheard stories of those he portrays. This book of photographs is an unspoken narrative. Or it is Tromp’s version of the tale. We see a man and a woman posing arm in arm in front of a store. Laughing, they look at us. His head is covered, according to Islamic tradition. She is wearing her blond curls hanging loose. Alongside a pearl necklace, a cross dangles from her neck. Christians and Muslims do not go through life in the affectionate arms of one another – or have we missed something? Are we mistaken? Has the unbridgeable gap suddenly been sealed? Tromp takes his photographs with a 35mm or a midsized camera. This lets him work quickly and see his subjects from close by. There is very little difference between what he sees and the eye of the camera. The only thing that divides the photographer from those being photographed is the question of the photograph being made of them. The camera serves as a pretext, the implicit excuse to start the conversation. The photograph is the proof of consent, the often tender, vulnerable and sometimes moving result. This leads to the fact that we want to give names to the people, the protagonists in this book. Names of their own make them characters. Names give them a fictional identity. They create the possibility of filling in the personalities. The name of Mme De Guermantes caused the narrator in Proust’s A la recherche du temps perdu (1913-1927) to imagine a mysterious lady from an 18th-century aristocratic milieu. She would live in seclusion, preferably in a monumental castle. (1) As Proust later reveals, actual encounters with the woman who bore the name deflated the poetic interpretation, time and time again. Perhaps the desire to give names to the people portrayed by Tromp is an expression of the fact that these people seem close to us. You recognize them. You identify with them. Tromp’s closeness has become yours. Imaginary or not, you can see yourself in their situation. The open structure in which the photographer has contained the portraits ask you for your own opinion, ask you to form a personal image of your own, just as he himself has done for you. A photograph takes part, unavoidably, in everyday life. At the same time, it establishes distance from everyday life, a space to begin to reflect. Or, as Roland Barthes once put it, ‘I see, I feel, hence I notice, I observe, and I think.’(2) Herein lies the photographic strength. Laughing and gesturing, but also surly or turned inwards, pictured full length or just the face, the image runs off the page. This is a fragment of a person, snatched or grabbed away from his or her life, a life that goes on, even after the button has been pushed. The succession of photographs and the manner in which they are arranged characterizes the passage of time in this book. Daytime moves slowly into twilight. In the shadow of the glass façades, the dark heads of passers-by sparkle, disappearing, then shine, highlighting shadows. It is becoming evening, night. Even in cosy villages and well-to-do neighbourhoods, this is the moment that calamity awaits. A thin woman paints her lips red, like her nails. Distrustfully, she looks off to the side. She doesn’t walk in the dark, she streetwalks. Farther up the street, there is fighting, the white shirts of the police officers clearly visible. Your quietly confirmed suspicions that this district is an agitated, ‘bad neighbourhood’, are undermined by a subsequent photograph: two corpulent, bald men, peaceably smoking in front of a coffeehouse or their favourite café. And maybe that thin woman we just saw was actually just the neighbour on her way out for the evening. Black-and-white does not exist. You forget the gradations, the variegations, the shading. You forget the shadows and in-between zones. A strict division between opposites does not exist, says Maarten Tromp in his photographs. The quarter bears witness to this. Light is not the reverse of dark, nor good of bad, nor day of night. The subtlety is visible in his images, tangible, sometimes even audible, despite – or thanks to – the physical silence of the book. Playing children, a woman smoking, a mother shopping, a man crossing the street. Streets, city squares, intersections: a busy place. Then a park. The sudden openness of the park is a breath of fresh air after the sometimes claustrophobic narrowness of urban streets. Birdsong that is not drowned out by traffic racing past, summer light filtered through green leaves, the emptiness of a Sunday morning, when Amsterdam is still asleep. Near the entrance to the park, a screaming man broke the serene silence. It is a reason to approach him. It is the contrast that creates the intriguing difference. At least you think so. And indeed, his facial expression is in stark contrast to the fine temperature, the pleasant weather. You are right. But don’t the pastel tints of his shirt rhyme in some wonderful way with the barely perceptible colours of the building in front of which he stands? Apparent opposites come to meet, or they come to agreement. 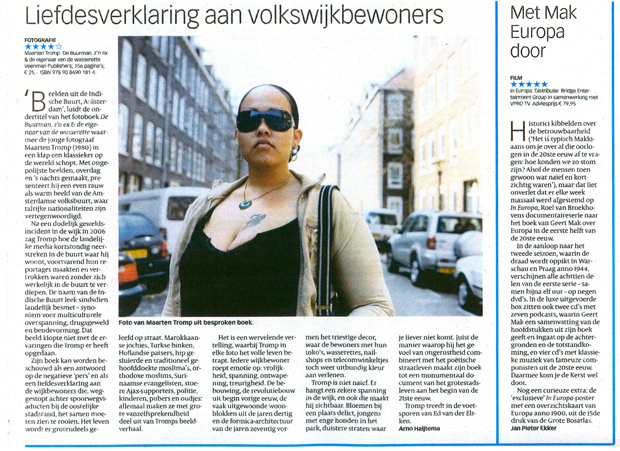 ‘An unbearable situation escalates with death’, screams a headline in de Volkskrant one morning in september 2006. And furthermore: ‘Growing unrest in the Indische Buurt in Amsterdam after a deadly knifing. According to the residents, the neighbourhood is controlled by scum fighting over drug dealing territories’. Printed media and TV, pouring superlatives, have ethnic groups pitched against each other while competing gangs are terrorising the community. From my window I walk to the television and back. I ask myself if I am looking at the same neighbourhood that they are talking about. For two and a half years, I have been taking photographs in the Indische Buurt in Amsterdam. With these photos, I reflect on the current, often biased formation and representation of images as in the media. I wasn’t searching for a story with a beginning and an end, but I was trying to capture the atmosphere that characterises the neighbourhood for me. A sequence of moods and emotions, alternating day and night. A neighbourhood built out of moments, places and encounters. We look and think in subconsious patterns and prejudices cloud our perception, passing what we already know - or do we? ‘Beelden uit de Indische Buurt, Amsterdam’, luidt de ondertitel van het fotoboek De buurman, z’n ex & de eigenaar van de wasserette waarmee de jonge fotograaf Maarten Tromp (1980) in een klap een klassieker op de wereld schopt. Met ongepolijste beelden, overdag en ’s nachts gemaakt, presenteert hij een even rauw als warm beeld van de Amsterdamse volksbuurt, waar talrijke nationaliteiten zijn vertegenwoordigd. Na een dodelijk geweldsincident in de wijk in 2006 zag Tromp hoe de landelijke media kortstondig neerstreken in de buurt waar hij woont, voortvarend hun reportages maakten en vertrokken waren zonder zich werkelijk in de buurt te verdiepen. De naam van de Indische Buurt leek sindsdien landelijk besmet – synoniem voor multiculturele overspanning, drugsgeweld en bendevorming. Dat beeld klopte niet met de ervaringen die Tromp er heeft opgedaan. Zijn boek kan worden beschouwd als een antwoord op de negatieve ‘pers’ en als een liefdesverklaring aan de wijkbewoners die weggestopt achter spoorwegviaducten bij de oostelijke stadsrand, het samen moeten zien te rooien. Het leven wordt er grotendeels geleefd op straat. Marokkaanse jochies, Turkse binken, Hollandse patsers, hip gesluierde en traditioneel gehoofddoekte moslima’s, orthodoxe moslims, Surinaamse evangelisten, stoere Ajax-supporters, politie, kinderen, pubers en oudjes: allemaal maken ze met grote vanzelfsprekendheid deel uit van Tromps beeldverhaal. Het is een wervelende vertelling, waarbij Tromp in elke foto het volle leven betrapt. Iedere wijkbewoner roept emotie op: vrolijkheid, spanning, ontwapening, treurigheid. De bebouwing, de revolutiebouw uit begin vorige eeuw, de vaak uitgewoonde woonblokken uit de jaren dertig en de formica-architectuur van de jaren zeventig vormen het trieste decor, waar de bewoners met hun toko’s, wasserettes, nailshops en telecomwinkeltjes toch weer uitbundig kleur aan verlenen. Tromp is niet naïef. Er hangt een zekere spanning in de wijk, en ook die maakt hij zichtbaar. Bloemen bij een plaats delict, jongens met enge honden in het park, duistere straten waar je liever niet komt. Juist de manier waarop hij het gevoel van ongerustheid combineert met het poëtische straatleven maakt zijn boek tot een monumentaal document van het grotestadsleven aan het begin van de 21ste eeuw. Tromp treedt in de voetsporen van Ed van der Elsken. In september 2006 trekt een dodelijke steekpartij met rumoerige nasleep in de Indische Buurt in Amsterdam landelijke aandacht. De negatieve berichtgeving over de buurt bereikt een hoogtepunt, en kranten en televisieprogramma’s buitelen over elkaar heen met het ene alarmerende verhaal na het andere. In de Indische Buurt staan verschillende bevolkingsgroepen lijnrecht tegenover elkaar, klinkt het, en maken rivaliserende bendes de straten onveilig. De buurt staat, kort gezegd, op ontploffen. Buurtbewoner en fotograaf Maarten Tromp loopt heen en weer tussen zijn televisie en het raam. Woont hij echt in dezelfde buurt als waar op televisie over gesproken wordt? Natuurlijk, de sfeer in de Indische Buurt is anders dan in de gemiddelde Vinex-wijk. Zo’n zestig procent van de inwoners is van niet-westerse afkomst. De bevolking is relatief jong en laagopgeleid. Nergens in de stad is het percentage lage inkomens zo hoog als in het westelijke deel van de buurt. Maar het is in de Indische Buurt ook veiliger dan gemiddeld in Amsterdam. Tromp ervaart de buurt door haar afgezonderde ligging achter het spoor bovendien als een oase van rust in de gejaagde stad. Een buurt met een eigen karakter, dorps en grootstedelijk tegelijk. De Indische Buurt die hij kent, is een heel andere dan die hij op televisie ziet. Tromp is op dat moment al bezig met een fotoproject over zijn buurt, mede in reactie op de beeldvorming in de media en de politiek. Het mediaspektakel rond de steekpartij sterkt hem in de overtuiging dat dit belangrijk werk is. Nu, twee jaar later, ligt zijn boek in de winkels: De buurman, z’n ex en de eigenaar van de wasserette. Met zijn boek wil Tromp de strijd aangaan met de beeldvorming in de media en mensen met hun gekleurde blik confronteren. Zijn foto’s tonen in een eerste oogopslag vaak de bekende beelden van straatcultuur in arbeiderswijken, maar verraden bij nadere beschouwing de nuances die daarachter schuilgaan. Bij een eerste blik op het omslag van het boek zien we een groep Hindoestaanse jongens dreigend op ons aflopen. Zijn dat knuppels in hun handen? Nee, het zijn cricketbats. De jongens lopen terug van een wedstrijdje in het park. Op een andere foto poseren drie jonge Marokkanen in hiphopkleding stoer voor de camera. Ze lijken zich heel wat voor te stellen van het plaatje, maar zien niet dat een bejaarde vrouw op de achtergrond geamuseerd toekijkt. In alles ademt het boek een liefde voor de volksbuurt, waar de rafelrandjes van het stadsleven ontbloot liggen in een sfeer van opgewekte soberheid. Tromp ziet ook nadrukkelijk schoonheid in de duistere kanten van de buurt: een aanzienlijk deel van de foto’s maakte hij ‘s nachts. Vaak missen die nachtfoto’s een duidelijk onderwerp. Het zijn composities van schimmen. De straten zijn leeg, en de nachtwandelaars verzamelen zich in kleine groepjes. Het is vaak onduidelijk waar ze mee bezig zijn, en dat schept een suggestie van avontuur. Voor Tromp waren de onvoorspelbare situaties waarin hij tijdens zijn nachtelijke tochten belandde vaak even belangrijk als de foto’s waarmee hij thuiskwam. ‘De commercie en het vermaak van het ‘hippe’ Amsterdam lijken ver weg,’ schrijft hij tevreden in zijn inleiding. Maar op een foto van een graafmachine die het puin van een gesloopt huizenblok verzamelt, werpt de ontembare zucht naar vooruitgang haar schaduw al vooruit. Er is geen buurt in Amsterdam waar sociale huurwoningen in zo’n rap tempo verdwijnen als in de Indische Buurt. Drie grote woningcorporaties hebben de handen ineengeslagen om de buurt ‘op te knappen’. Samen investeren ze 275 miljoen euro in het ‘Wijkactieplan’, dat bijvoorbeeld van de Javastraat, de belangrijkste slagader van de buurt, een ‘Mediterraanse winkelboulevard’ wil maken. De corporaties doen dit uiteraard allesbehalve belangeloos: in ruil voor hun investering mogen ze 2200 sociale huurwoningen opwaarderen of verkopen. Het stadsdeelbestuur toont zich in het kader van de ambitie om ‘aan te sluiten bij de stedelijke dynamiek’ in het wijkactieplan dolenthousiast over de verwachte toestroom van de middenklasse. Voorlopig is Tromp niet bang dat zijn buurt, in navolging van voormalige volksbuurten De Pijp en de Jordaan, door een vloedgolf van yuppen haar oude karakter zal verliezen: daarvoor is het aantal sociale huurwoningen in de Indische Buurt vooralsnog te groot. Toch is plaatst hij kanttekeningen bij de stadsvernieuwing, die ook op andere Amsterdamse buurten, zoals De Baarsjes, Westerpark, Noord en het Wallengebied, haar stempel drukt.